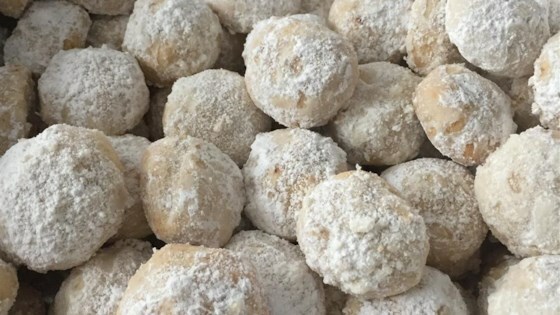 "Also sometimes called 'Mexican wedding cookie', 'Russian tea cakes', or 'butterballs', can also be made into crescents. You can also substitute pecans and they are very good as well. This is the best version of these I have ever seen, it was given me by a friend who grew up in central Europe." Cream butter or margarine in a bowl, gradually add confectioners' sugar and salt. Beat until light and fluffy. Add almonds and vanilla. Blend in flour gradually and mix well. Shape into balls (or crescents) using about 1 teaspoon for each cookie. Place on ungreased cookie sheets, and bake for 15-20 min. Do not brown. Cool slightly, then roll in the extra confectioners' sugar. These buttery bites are delicious with coffee or tea.